On September 21, 2013 the PSSC meeting was held in the Point Loma district of coastal San Diego. These two gardens are only a few minutes apart. Both are established gardens where many unusual and rare species can be seen. GARDEN NUMBER ONE: Home of John Collom at 4370 Santa Monica Ave, San Diego, 92107. John's garden is about twenty years old and has both mature palm trees and cycads. It is unique in that the garden is all you see from the street with his home way in the back of the yard. He has attractive Hedycscepe, Roystonea, Pritchardias and a very niceLivistona saribus. And, there's lots of cycads, some mature and in cone. His garden demonstrates what a little planning and time will provide. GARDEN NUMBER TWO: Home of Dennis and Laura Willoughby at 4438 Pescadero Ave, San Diego 92107. 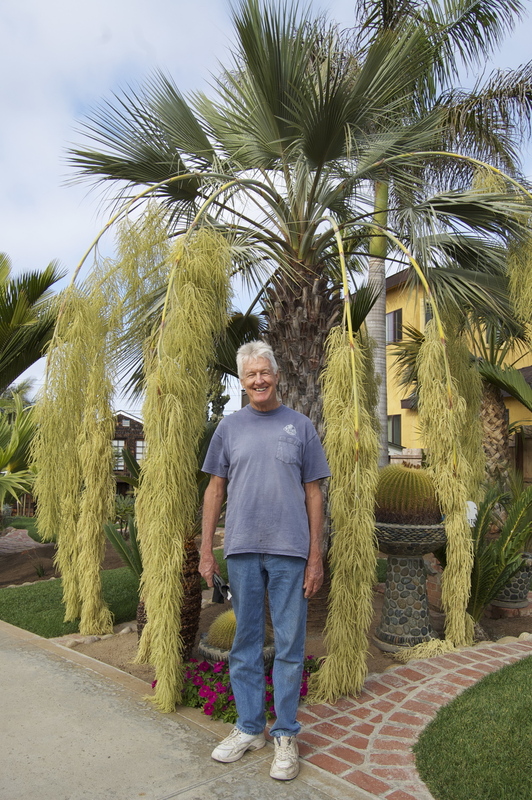 Dennis started his garden in 1990 and he presently has about 260 species of palms growing. When you visit, make sure you get a look at his Acanthophoenix rubra, which is thirty feet tall, the Dypsis bejoufa which is one of the biggest around, and hisArenga hookeriana with its eight foot leaves! In fact, Dennis has some palms that even stump the experts and no one is quite sure what they are. You'll love this garden. 11 AM: General Members arrive at the Collom residence and tour the garden. 12:15 PM: Depart the Collom garden and go to the Willoughby Garden. Bring your food item. NOTE: Point Loma is near the very west end of Freeway 8 at the ocean, just south of Ocean Beach. But, to get there, you must follow directions below as some freeway 5 and 8 interchanges don't exist! One exit before Freeway 8 interchange, exit onto Sea World Dr/Tecolote Rd. Turn left on Santa Monica Ave and go up the hill to 4370 Santa Monica Ave. Turn left onto Sunset Cliffs Blvd. Go toward the ocean on Santa Monica Ave for one half a block.